The situation of Berwick-upon-Tweed, at the mouth of the principal river of the Borders, and on the contested frontier between England and Scotland, has been the source both of its periods of prosperity and sometimes of its misfortunes. Though Berwick has now been in England for more than 500 years, when it first emerges in the historic record it is as part of the consolidated kingdom of Scotland, and by 1130 it was established as one of the first Royal Burghs of Scotland. By the 12th century, in the reign of King David I of Scotland, Berwick was a thriving town and probably particularly significant as a port. Commercial links with Flanders were encouraged to foster the wool trade and a colony of Flemish immigrants settled in Berwick. A royal mint was established in the town by 1153 and coinage continued to be produced there for at least the next century and a half. The area between Marygate and the Tweed shore is thought to have formed the core of mediaeval Berwick through later centuries. It was the 13th century that probably marked the peak of Berwick’s importance and prosperity. Scottish kings often stopped there, and a number of religious houses, including the four major orders of Friars and a Cistercian nunnery, were established. As a port, Berwick was extremely significant, probably dealing with most of Scotland’s import and export trade. Exported goods included fish (especially Tweed salmon and herring), grain, wool and hides. Berwick’s Castle is first mentioned in about 1160 (although already a building of considerable strength), and in following centuries, like the town, it passed between English and Scottish hands until 1482; its most famous moment being in 1292, when King Edward I gave his decision in favour of John Balliol as Scottish King in the Castle’s Great Hall. It survived until 1604 when it was granted to Sir George Hume, who built a large house within its walls, but when he died in 1611 the house and Castle became a convenient quarry for local building projects. From 1174 until 1482, the history of Berwick was marked by recurrent conquest and reconquest by the armies of England and Scotland as they competed for strategic advantage. Berwick’s greatest disaster occurred in 1296 when Edward I (the “Hammer of the Scots”) captured and sacked the town, slaughtering many thousands of the inhabitants. Following this, he built entirely new town walls (which in part can still be seen) and this work of fortification was continued by his son Edward II who spent great sums on the walls, especially after Battle of Bannockburn. Although the town continued to pass backwards and forwards between the Scottish and the English, this does not always seem to have damaged the economy of the town. By the early 14th century Berwick was exporting twice as much wool as its nearest competitor, Aberdeen. However in the later part of the 14th century the ravages of the Black Death contributed to a dramatic decline as resources and people were drained from the town. As the Wars of the Roses neared an end, Berwick was retaken for the English king Edward IV by Richard, Duke of Gloucester, in 1482 – and it has remained in English hands ever since. 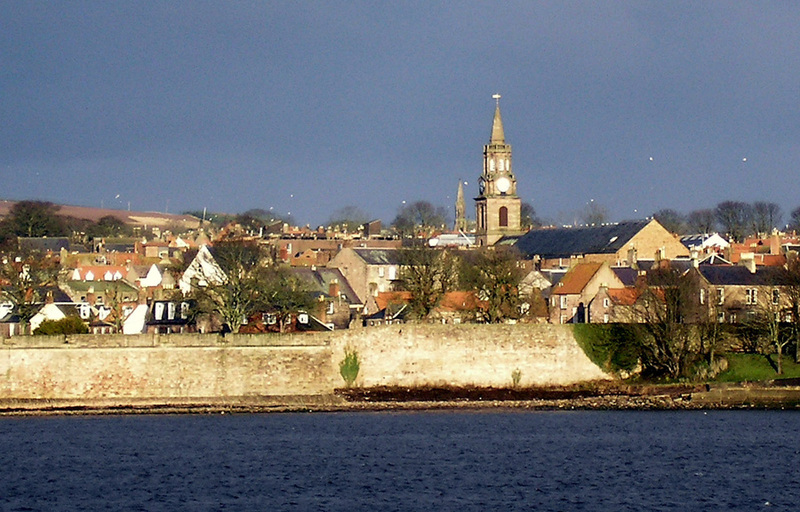 Berwick continued to be affected by border conflicts, which reached their climax with the Battle of Flodden in 1513, and regular attention was given to the town’s defences. Between 1558 and 1570, the massive Elizabethan walls were constructed to ensure the security of Berwick, but this marked a significant change of policy because they enclosed a much smaller area of the town than the existing walls which dated from the time of Edward I. In the event the new fortifications were never put to the test, and in 1603 the accession of James VI of Scotland to the English throne as James I brought a measure of peace to the Borders. In the time of Elizabeth I, Berwick’s economic viability was heavily dependent upon the presence of the military garrison which had its own Governor. After the Union of the Crowns in 1603, the garrison was drastically reduced and Berwick fell into decline as a strategic military centre. It was James I who signed a charter in 1604 confirming the Freemen of Berwick (still existent) in their civic and property rights. Also on the orders of James, the construction of a stone bridge (the Old Bridge) across the Tweed was begun in 1611, to replace the rickety wooden bridge which was the previous means of crossing. During the Commonwealth under Cromwell, a new parish church was built, on a severe and restrained design, using stones recovered from the derelict Berwick Castle. This is one of the few parish churches built in England during the Commonwealth period. The new Town Hall (or Guild Hall) was built in the 1750s, and it replaced a long succession of mediaeval tolbooths and town halls. Featuring a 150 foot spire and bell-tower, and often mistaken for a church, it became the centre-piece of the town. Until 1849 it also housed the town gaol, and the original cells can still be seen on the upper floor. During the 18th century, a good proportion of the town was rebuilt, upon the pre-existing mediaeval street plan, and much of the historic core of Berwick that one can see today is 18th century in date. Continuing military concerns, heightened by Jacobite incursions, led to the building of the military Barracks from 1717 to 1721 to provide dedicated accommodation for troops who previously required unpopular billeting in the town; it was one of the first purpose-built barracks in the country. 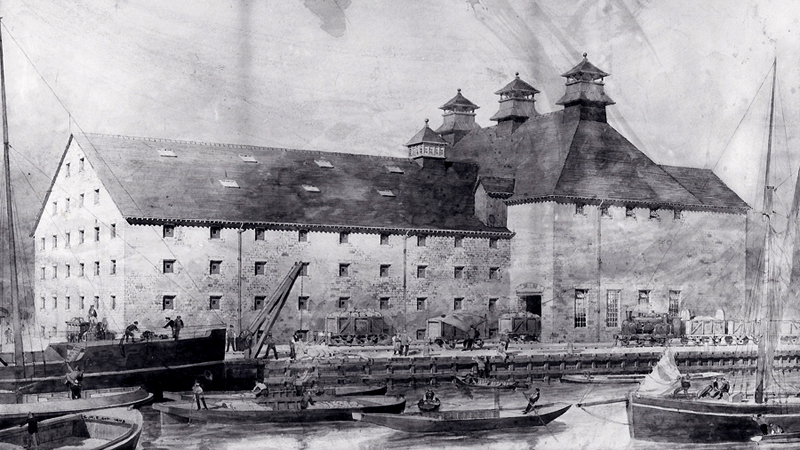 It was followed in 1749 by the building of a separate Magazine for the storage of gunpowder. Replacing a long succession of mediaeval tolbooths and town halls, the new Town Hall (or Guild Hall) was built in the 1750s; featuring a 150 foot spire, and often mistaken for a church, it would henceforth be the centre-piece of the town. In 1850 the Royal Border Bridge, designed by Robert Stephenson, was opened by Queen Victoria, allowing trains for the first time to travel between Edinburgh and London. Although this was a convenient means of transporting goods and people, it led eventually to the demise of coastal shipping from Berwick. and ship building on the Quayside (especially of the fast sailing Berwick Smacks) and by the development of ice houses in Berwick, from the late 18th century, allowing fresh salmon, rather than smoked, cured or salted fish to be sold in London. Corn merchants had benefited from the recent agricultural improvements in north Northumberland and in the 19th century their granaries had become a regular feature of the urban architecture of Berwick. This development of business was assisted by such public works as the building of the new pier between 1810 and 1821 and the coming of the railways, initially to Berwick from Edinburgh in 1846. In 1850 the Royal Border Bridge was opened, allowing trains now to travel between Edinburgh and London. Although this was a convenient means of transporting goods and people, it led eventually to the demise of the coastal shipping. As business developed within the congested area within Berwick’s Elizabethan walls, so it grew in Tweedmouth and Spittal, encouraged by the development of Tweed Docks in 1872 and 1877 and the said coming of the railways. To ease congestion and assist the commercial development of the town most of the ancient Gates in the walls were removed in the 1850s. Another effect of the industrial congestion within the walls, and the demise of the walls as needed for fortification after the end of the Jacobite rebellions of 1715 and 1745 was that quality residential housing spread along the top of the walls, and north of the town in the latter 18th and 19th centuries. At the same time to encourage the fashion for promenading, the New Road and Pier Road along the River Tweed were built in 1816. Also, as a sign of the town’s cultural change and importance, the country’s first Field Club, the Berwickshire Naturalists, was founded in 1831 by a local doctor. 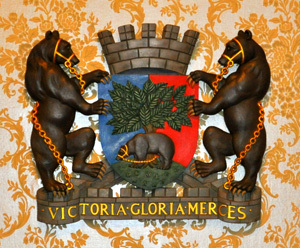 The 19th century was also a period of constitutional change, in 1835, the Municipal Corporations Act ended the centuries of control of the Guild of Freemen in Borough affairs, replacing this authority with elected town councillors. A year later in 1836, Tweedmouth and Spittal became incorporated into Berwick and the enlarged town was constituted as a county of itself, although in practical terms it was included within Northumberland County. As physical evidence of this change, in 1848/9 a new gaol and court house was built, later becoming the Municipal Buildings and replacing the 1750s Town Hall. Reflecting these changes, the historic post of Governor ended in 1833 when the Governor’s House was sold off, although the town’s loyalty to the military showed itself with the Barracks (which had been under threat of being sold in 1856) becoming the depot and headquarters for the King’s Own Scottish Borderers from 1881. A detailed artist’s impression of the former Tweedmouth Maltings owned by Messrs J. P. Simpson & Company, situated next to the railway sidings at the Tweed Dock. The Tweedmouth Maltings was built in 1901 and unfortunately burned down in November 1933. The building covered an area of several hundred square feet and cost £12,000 to build. Today Simpsons Malt operations are situated at the Tweed Valley Maltings, Tweedside Industrial Estate, Berwick-upon-Tweed. The first half of the twentieth century saw Berwick and the surrounding area relying on the traditional industries of agriculture, salmon net fishing, herring fishing, boat building and coal mining with the harbour and railways transporting many of the goods such as cereals, wood, coal, fish and other local commodities. Transportation of goods through Berwick improved tremendously with the opening of the Royal Tweed Bridge in 1928 as the main road bridge over the River Tweed. This would lead eventually to an expansion in manufacturing on the Tweedmouth side of the river. However it was not until the second half of the century after two world wars and a depression that a more diverse manufacturing sector appeared, along with a growth in tourism due largely to more prosperity in the country and the transport links of the railways and buses. By the 1960s and 1970s Berwick’s manufacturing sector had grown substantially, creating more diverse employment opportunities for local people than had previously existed, giving Berwick an air of prosperity. The diversity of employment at this time can be seen from the following list of just some of the companies operating during this period; Jus Rol (pastry production), Bryson’s (wholesale bakers), Pringle of Scotland (knitwear), Simpsons Malt (malt barley production), Allan Brothers (wood products), Polychrome (offset plate production), Berwick Shipyard, Berwick Salmon Fisheries Company (net salmon fishing), McCreath’s (grain merchants), William Elder & Sons (agricultural engineers), Landels (engineers), Springall’s (steering wheel manufacturers), Van Smirren (shell fish processors), Tweeddale Press (newspaper publishers and government printers), Martins (book printers), How & Blackhall (general printers). There were two notable setbacks in this period. The first was the Beeching rail cuts in the 1960s which led to the closure of most local branch lines in the area; and then, in 1963, with the closure of the regimental barracks of the King’s Own Scottish Borderers, the town had lost its famous regiment. Nearing the end of the century the ‘air of prosperity’ Berwick had enjoyed in the 1960s and 1970s had gone and hundreds of jobs had been lost with many of its manufacturers closing down; this being due to a number of factors which included periods of recession, automation and new technology, along with cheaper imports from a now expanding global economy. The net salmon fishing had also contracted after many fishing stations on the River Tweed were closed after being bought by a fishing conservation organisation to preserve salmon stocks, along with the closure of the Berwick Salmon Fisheries Company in the late 1980s. The Russian general cargo vessel Capella leaves the harbour in ballast after offloading her cargo (probably fertiliser) at the Tweed Dock. She was built in 1980 in Finland at the STX Turku Shipyard, she has a gross tonnage of 2,349 tonnes, length 95 metres, beam 14 metres, and draught of 3.6 metres with a top speed of around 10 knots. Photo: Winston Carson. However with road links to the Berwick bypass to the west of the town which opened in November 1983, among manufacturing companies still providing employment at the end of the century were the Jus-Rol, Simpsons Malt and Allan Brothers; and as at the start of the century the harbour and the railways featured prominently in the town’s economy. In the case of the harbour using much larger ships, its handling cargoes were mainly cereal and fertilisers. The railways were now electrified with passenger trains being the main traffic on the East Coast Main Line. Tourism and the service sector were now the growth industries. This can be best illustrated with the expansion of the Berwick Holiday Centre on a former army training camp next to the Magdalene Fields, as well as the Haggerston Castle Holiday Park just south of Berwick. 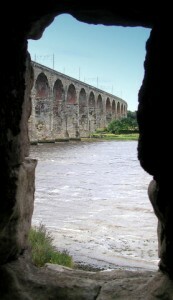 Pictured in the foreground is the Berwick Bridge or Old Bridge as it is known locally. It was built between 1611 and 1634, and until 1928 it was the main road bridge over the River Tweed. Its designer was James Burrell engineer, who was the Surveyor of Works of the fortifications in Berwick and overseer of the project. He was assisted on the project by lead mason Lancelot Bramston and lead carpenter Roger Richardson along with a large contingent of other masons, carpenters, labourers and quarrymen. The Berwick Bridge is 354.8 metres long with 15 segmental arches; it is 14 metres high at its highest point near the Berwick side, and 5 metres wide. The largest arch, the penultimate on the Berwick side, is 22.9 metres, the deck falling gradually towards the Tweedmouth side. The red sandstone required for the building of the bridge was quarried locally. The piers were founded on wood piles; the 800 plus oak trees which were required for piling came from the Chopwell Forest near Newcastle and were shipped to Berwick. Although work on the bridge was more or less complete in 1624 it was not until 1634 that the accounts were finally closed and the bridge was officially completed. The Berwick Bridge was the largest bridge constructed in the country during the 17th century. The accounts for the Berwick Bridge from 1611 are held at the Berwick Record Office. In the centre is the Royal Tweed Bridge, which was constructed by L G Mouchel and Partners between 1925 and 1928; it was opened in 1928 by the Prince of Wales, later King Edward VIII. In the early part of the 20th century, the bridge was notable for its size, and for the way that its four arches increased in size from the south to the north, taking into account an upward gradient. The arches measure 50.9 metres, 75.6 metres, 86.9 metres and the fourth at 110 metres was the longest arch in Britain when the bridge was built. The Royal Tweed Bridge carried all the main A1 road traffic through Berwick until the opening of the Berwick bypass to the west of the town in 1983. In the background is the Royal Border Bridge; it was the last remaining link in the east coast rail line from London to Edinburgh, and it was opened in August 1850 by Queen Victoria. The Royal Border Bridge was commissioned as part of the Newcastle & Berwick Railway line. Robert Stephenson, its architect, was the railway’s engineer, though most of the line engineering was undertaken by Thomas Harrison under Stephenson’s supervision. The viaduct is built on a curve and consists of 28 arches; the bridge was constructed in masonry with brickwork soffits (under-sides of the arches) covered by stone cladding. The arches each measure 18.6 metres and the whole bridge is 658 metres long; with the greatest height over the bed of the river being 38.4 metres. The bridge contract covered a one mile length of line, and the non-masonry sections consist of earth embankments at the Tweedmouth end of the bridge. Several 19th century published histories of Berwick and Northumberland have been made available online in digitised versions. A list of links to these can be found on the Books online page. The New Brunswick settlers : 19th century emigration from Berwick and North Northumberland. Gypsy families of North Northumberland and the Borders . Images in the History Section along with those on the Home Page and in the Museum section Window on Berwick: courtesy of Mr Richard Ormston, Berwick-upon-Tweed. Image of Simpsons Malt, Tweedmouth (1901-1933): with kind permission of Mr Simon Simpson OBE, Chairman, Simpsons Malt Limited, Tweed Valley Maltings, Berwick-upon-Tweed. Cowe, Francis. Berwick upon Tweed: A Short Historical Guide; revised edition. Berwick-upon-Tweed: J. D. Cowe, 1998. Ellison, Margaret. “An archaeological survey of Berwick-upon-Tweed”, in P. Clack and P. Gosling (eds), Archaeology in the North. Durham: Northern Archaeological Survey, 1976. pp.147-164. Menuge, Adam, and Dewar, Catherine. Berwick-upon-Tweed: Three Places, Two Nations, One Town. Swindon: English Heritage, 2009. Walker, Jim. Berwick-upon-Tweed: History & Guide. Stroud, Glos. : Tempus, 2001.